Pros - Strong with Speakers and Headphones alike. Beautiful, I mean very classy looking. Cons - No line out muting when headphone inserted. My system Win10>HD-DAC1>AQ-King-Cobras>Parasound Zamp v.3>ProAc Tablettes. First the FLAC with the ASIO on Foobar is clean, with very detailed and wide sound stage with the Tablettes tweeters at ear level. BANG! This is the sound of the DacMagic Plus hitting the recycle bin in the garage after years of cutouts, hisses and pxxx poor customer support. Proud to admit we are now a Marantz only household with two receivers, AV processor, reference SACD player, and now this beauty. do you experience loud relay clicks? I own this DAC for atleast 7 months now and so I thought I would make a review cuz I'm planning to sell this (which I'll tell you why at the end of this review). I haven't wrote a review for a DAC/AMP so go easy on me. Lets get started with the usual stuff. Build - If you have owned Marantz products before then you will really appreciate how the keep continuing/improving on the looks whilst keeping the old "marantz" vintage looks, with the wooden looking (its plastic) sides, the marantz display hole (don't know how exactly it is called). The DAC is almost metal except for the sides and hence it is quite heavy around 6 kgs if I remember it right. The volume knobs, on/off switch, source selector switch are all metal (Aluminium I think). I have the Black version and they look stunning. 5/5 stars here. A remote control is also included so you really don't use the knobs much. Also a RCA cable and USB type B connector. Features - It is a DAC, headphone amp that can drive 600 ohm headphones, a preamp too. Can run your Apple devices, has input from AUX, RCA connections, USB ports on front and rear (front for the apple devices and rear for your external hard drives and usb sticks), It supports DSD, FLAC... and the list goes on, literally everything. I mostly listen to flac 24/196 and it sounds amazing. 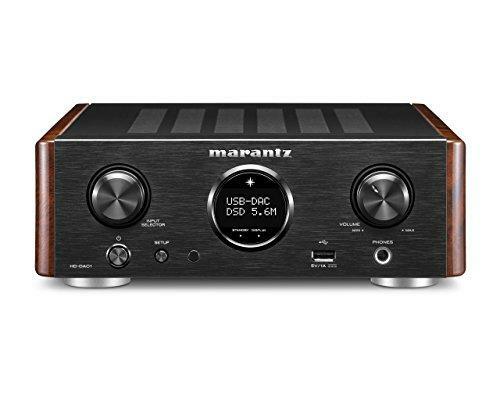 The OSX does not need any drivers to run but windows need some drivers which can be found on the Marantz website. There are three gain levels for the amp section, low, medium and high. I found the amp could drive the DT880 600 ohm version almost very easily with the volume knob on less than the mid of the spectrum. Of course to use the DAC section then you need a digital input, a USB, optical connection. Sound Quality - Before I continue, please keep in mind this is my only desktop amp I have ever owned. The previous amp was a Fiio E12 but thats all. So my comparison is literally against nothing (which isn't even a comparion ) But, I could tell you how it sounds from my liking. Lows - The Bass reaches very low and has a great punch to it. It adds a lot of bass quality to HD600 and HD800s which many say lack in bass but I find them to be just right. Mids - The mids are the best part of the DAC comparing to my portable Cowon X7/Fiio E12 combo. The vocals sound very well and guitars sound great. I somehow feel that the HD DAC synchronizes very well with Sennheisers. The guitars sound exactly like the way I want them to be. + The builtin jitter remover eliminates every noise from the PC and you literally hear nothing when there is no song playing, No hiss, no statics which is amazing. - The relay clicks are loud and you could think it is a broken device or something. But it isnt. It only happens when the frequency changes but I think its quite normal. - Runs quite hot but I saw some videos on how tube amps can fry an egg so I'm fine with this. + Waits until your idevice is fully charged and then auto shuts off. Ok, so to the part why I want to sell this amazing dac is, It has no XLR connector. While it is not an issue for most of the users, I have recently "upped" my game to the HD800 and LCD XCs and I also got a very nice XLR connector cables with. And technically a balanced connection should sound better (cuz I have no experience with balanced connection). But don't get me wrong, this is a very well, clean, smooth and a warm sounding DAC and very nice head amp which can drive most of the headphones (except for some power hungry orthos).